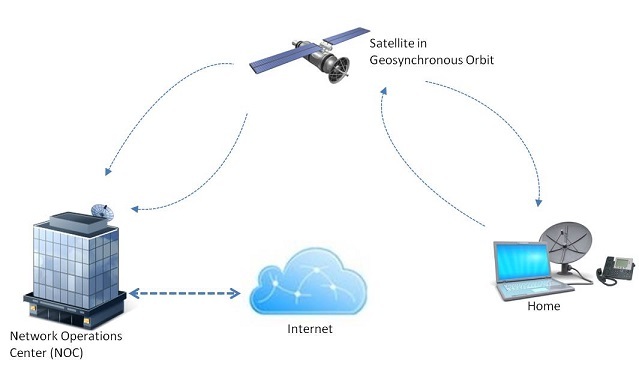 Satellite Internet service is a technology for bringing high-bandwidth broadband (also known as high speed) service to homes and small businesses via a satellite link (between a satellite dish at your location and an orbiting satellite). Similar to other high speed solutions the service is always on and available to the user as long as the modem is powered on. To use this type of service a provider will install a satellite dish at a preferred location at your home, typically on your roof or on the side of the building. The only requirement is that you have a clear view of the southern sky. Once installed and set up all you need to do is plug your PC into the modem (supplied by the service provider) and your off and running. Below is an illustration of the full system. As with most other broadband solutions this type of service is assymetric also (meaning download speeds are different than upload speeds). Depending on the type of plan, you can get a broadband speed up to 15Mbps (Megabits per second) on the downlink and up to 3Mbps on the uplink. Other plans are available that have a lower speeds but also have a lower monthly fee. The lowest monthly fee plans typically provide a speed of 5Mbps on the downlink and around 1Mbps on the uplink. Your actual speed will depend on some factors like weather and monthly usage. There is typically not a huge range in speed options and plans are more priced around monthly data usage in GB (Giga Bytes). However, the great advantage of this service is that it is available almost anywhere in North America. So, if you cannot get cable or DSL services then it becomes a good option. There are only a few provider options for Satellite Internet service so pricing is competitive but very similar between them. Multiple plans are offered which are more based on amount of usage per month rather than speed (although some providers have higher speeds available for higher prices). Pricing typically starts in the $50 per month range for a basic plan with up to 10GB of usage per month and can rise up to $130 per month for the maximum usage plans (in the 25 to 40GB per month usage range). Some providers have introductory pricing for the first 3 or 6 months which can save you some money but in general this type of service is more expensive than DSL or Cable technologies., Also, look out for any installation or activation fees when comparing providers as they could be a surprise on your first bill. One thing that should be noted here is that most providers require a minimum 24 month contract. Make sure you understand the small print surrounding terminating this service and any fees associated to cover your bases. To find out if you can receive this service simply visit the provider of interest website and use their simple availability search tool. This will quickly identify if this service is an option for you. The below table provides a quick comparison of the two most common service providers for residential usage. to 40GB $300 to purchase or $10/mo. * - speeds are not guaranteed and are "up to" numbers. Speeds are faster than dial-up service. Equipment is supplied to you by the provider (fees may apply). Monthly billing is typically fixed, regardless of usage time. It is available in almost all locations, especially an advantage if you live somewhere that does not get Cable services or where the location is to far from a Central Office (CO) to receive DSL service. It is typically more expensive than other technologies available. It requires a satellite dish to be installed at your premises. Speeds can be affected by the weather. With its higher costs and monthly usage limits, Satellite Internet service is mainly an option for those who live in a location that does not have other service options, such as Cable or DSL services.